This volume is the first to examine the commercial home from an international perspective, paying attention to the frequently occurring but often neglected forms of commercial accommodation including farmstays, historic houses, and self-catering accommodation. Conceptually, it helps to explain a range of behaviours and practices, for example the importance of setting and the nature of the host/guest exchange. The idea of home provides a conceptual bridge to related themes, for example identity, gender, emotional management and cultural mobilities whose investigation in a commercial home context offers fascinating insights into hospitality, tourism and society. This book is structured around three themes. The first is dimensions of the commercial home and includes discussion of issues pertaining to forms and characteristics and female entrepreneurship. The second theme considers the commercial home as an investigative lens to examine wider issues of society, hospitality and tourism such as the commercial home as a tool for rural economic development. The third theme, extending the commercial home paradigm, looks at new areas of development, including the Malaysian Muslim home as a site for economic and political action and the use of the home in marketing regional localities. Commercial Homes in Tourism is the first book to give recognition to this distinct, economically important and expanding form of tourism business by bringing together recent, international research on this common form of commercial tourism accommodation. 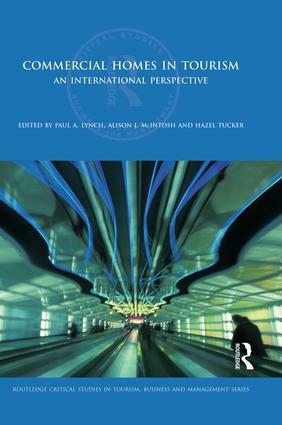 Given the global nature of the commercial home phenomenon, and owing to the originality of its theoretical contributions and practical insights, this book will be of interest across a broad range of subjects and disciplines interested in the examination of the home phenomenon, including students, academics and business practitioners.